In the summer of 2016, FEELS — an L.A. punk band we would never have discovered but for the fact that their eponymous first album was produced by Ty Segall — made us grin from ear to ear. Their musical lineage was as easy to identify as a freckle-faced redhead standing between two auburn-haired adults. Hole must have married X, we thought, and spawned a precocious young ‘un. It was one of those instantly fun records for which you willingly risk permanent hearing loss, because the only way to listen to it was to crank it through your earbuds loud enough that your public transport seat mates stare straight ahead even as they edge away. Did that for about a month solid, and promptly forgot about them. Well, not entirely. A year later, the estimable Kevin Morby released Shannon Lay’s solo album on his Woodsist imprint, and it was a pretty, folky wonder all the more notable for the fact that the lovely singing and acoustic finger-picking came courtesy of one of FEELS’ two guitarists. Living Water was a complete non sequitur, like learning that before Nick Drake released Pink Moon, he played lead guitar for Free or something. Shannon Lay’s solo album was delicate and melodic, and BORE ABSOLUTELY NO RESEMBLANCE to the raucous, minimalist band that Segall had taken to the studio the year before. Those two records were sufficiently great, and the musical distance between them was as alluringly broad as the Grand Canyon’s North and South Rim, so that when Post Earth was released in late February, we didn’t need to be asked twice to listen to it. It’s the best record we’ve heard so far this year, and by a muddy furlong. By the end of the record we are “Post Earth,” and why not? If these guys are rocking on Mars, it would be well worth the trip. Like getting your DNA profile back from 23 and Me, on their second album, we’ve discovered FEELS has relatives we never knew they had, and of course Sleater-Kinney gets a prominent branch on the family tree. 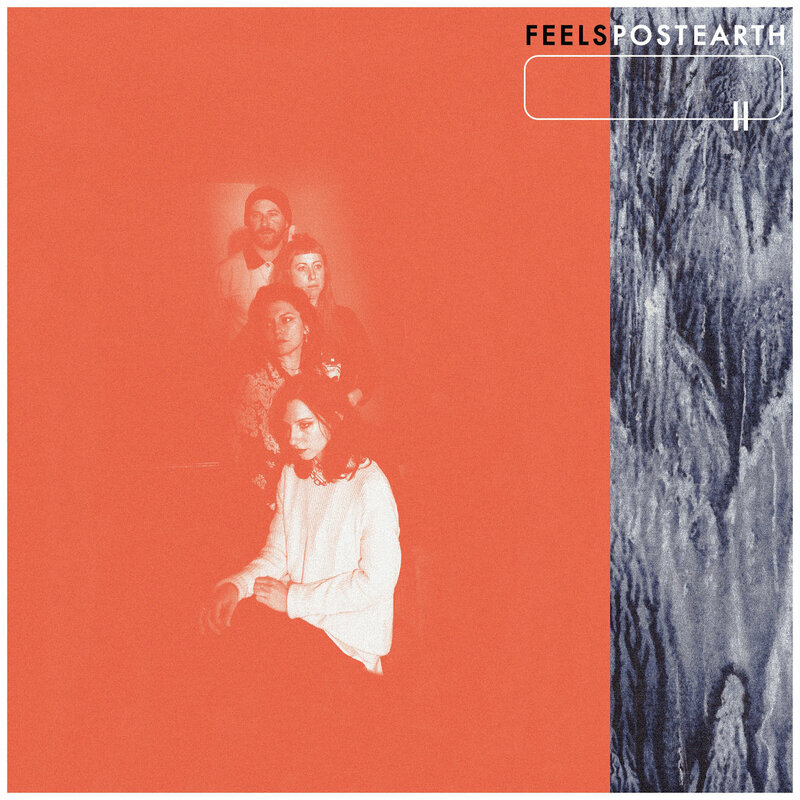 But aside from placing them in their rough taxonomy, the only things you really need to know about FEELS are these: their songs pack a post-punk punch. And whereas on their first rec some of the tunes might take odd detours from the melody, on this ‘un, Laena Geronimo and Shannon Lay never veer far from hummability, and they are warbling angels even if they candy-crush it for a few measures before returning us back to a state of Pylonesque grace. There isn’t a dull moment on the record. It is absolutely astonishing, and deserves to be mentioned in the same paragraph as Gang o’ Four’s Entertainment and Sleater-Kinney’s Dig Me Out, to name two records you know they’ve listened to. Look, this is shaping up to be a good year. We love Hand Habits’ gorgeous placeholder and The Brian Jonestown Massacre hits at least a few points better than Anton Newcombe’s late-season batting average. We just this morning downloaded Its Real by D.C. homegirl Mary Timony’s Ex Hex, and it is a powdered party in a packet, ready to be added to nitroglycerine. Capsula are back with Bestiarum, and the best punk band in Bilbao is once again rocking Spain so hard, we expect to see Iberia floating toward the Canary Islands. Yes, of course, it will be a national holiday when Wand’s Laughing Matter gets released, and what the Cosmonauts have let us hear from Star 69 gives us veritable chills. And Great Googlymoogly, the Mekons return to the scene in the weeks ahead. But if the year ended today, Post Earth would grab the laurels, and we’d be happy. Coming around the track near the end of the first quarter, FEELS leaves everyone else wiping their goggles. This entry was posted on March 22, 2019 at 7:25 pm and is filed under Uncategorized with tags "Post Earth", Feels, Shannon Lay, Ty Segall. You can follow any responses to this entry through the RSS 2.0 feed. You can leave a response, or trackback from your own site.